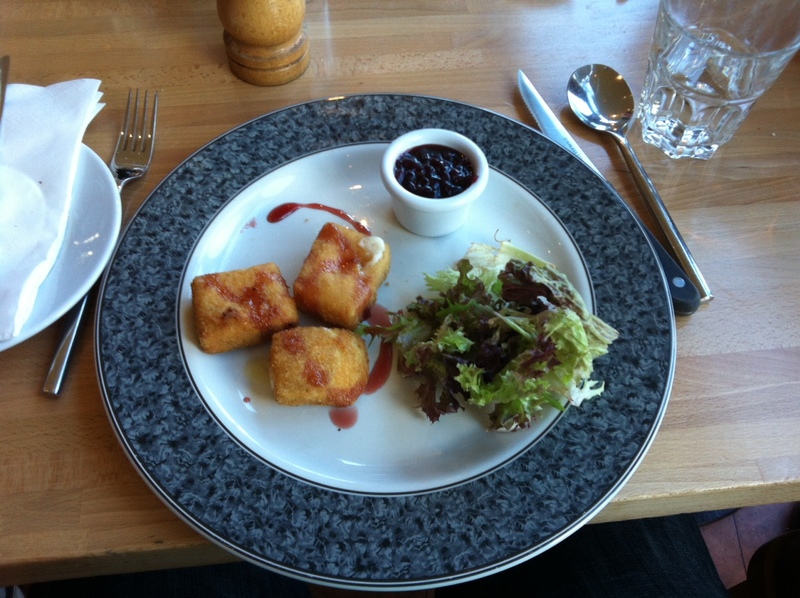 A few days ago I posted an apology about not blupdating for a while, and added a picture of oozing deep-fried brie as penance for my sins. Above is the complete, unadulterated dish, before I used my precise surgeon-like skills to cut a whole in the top. When I did that the cheese oozed everywhere, as you can see in my previous post here. I don’t really need to tell you how delicious it was, how darling, delectable, divine and exquisite, let alone gratifying, luscious and scrumptious. Thanks, old copy of the School Thesaurus. We were at Al Bivio (formerly known as Brio Pizza) in Hornbeam Park, Harrogate. The restaurant is run entirely by Italians, and is set in a modern, glass-filled room, with the bar at the centre. The welcome is outstanding, everyone was greeted as though they were old friends (although I am assured my family goes there a LOT). We were the first people there for the lunch menu (they also open for breakfast), and they were still printing off the specials for the day. That’s how special they were. As it turns out, I ate entirely from the specials menu, and for a main course I had Pancetta and Three Cheese Tortellini. No picture, I’m afraid, so you’ll have to make do with my telling you. You have to believe me! The sauce was rich, as you’d expect from the number of cheeses, and inside each tortellini (tortellino?) was a parcel of pancetta and cheese. The taste was indescribably brilliant (thanks a BUNCH, thesaurus), but there was a liiiiittle too much pasta, and not enough filling. Still gorgeous though. I have it on very good authority that the deep fried calamari (such a blatantly Italian dish) was addictively good, the minestrone was rich and filling, and the garlic salt dough balls were as fantastic as they sound. I don’t really have any criticisms of Al Bivio at all, except maybe their beer list. It’s the same Italian beers you get everywhere, Peroni etc. Italy has a fantastic brewing tradition, and it would be great to see an Italian restaurant in the UK reflect that and import some local specialty beers. You can also buy wines and ephemera from Al Bivio here (though the page may be a little sparse at the moment).